We camped for two days in Ponderosa Pines Campground right on the Bay of Fundy and the date is around the 30th of May 2011. We were in for a natural wonder: The Bay of Fundy. Incredible, magnificent, fascinating, captivating, enchanting.... One could go on for ever trying to describe this natural wonder, The Bay of Fundy. The tides in the Bay of Fundy are some of the highest in the world at 55.8 feet or 17 meters at their highest. Each and every day 100 billion tonnes of seawater flows in and out of the Bay of Fundy. During one tide cycle more water flows in and out than the combined flow of the world’s freshwater rivers, totally amazing. In July 2009, the Bay of Fundy was named as a finalist for the New 7 Wonders of Nature contest that ends in November 2011. Please cast your vote, it is the only Canadian entry left. You can also do what I did, text FUNDY to 77077 ( 25 cent charge applies) with your cell phone. We need to bring up the stats for the Bay of Fundy, you can check out the voting trends here. The Bay of Fundy's attractions are not just the tides, it is also home to 12 species of whales which can many times be seen from shore and a variety of shorebirds. Lobsters are also plentiful in the Bay of Fundy. They supposedly taste better and grow larger. One was just recently caught weighing in at 22.3 lbs or around 10Kg. More info on the beast. Hopewell Cape Rocks are located in The Rocks Provincial Park on the Bay of Fundy in New Brunswick. What is really different with this park is that you have to come back twice. Once for low tide and once at high tide. It is spectacular to see the differences in the tides. We have some pretty good tides (up to 18 feet at our place on Cortes Island) on the West Coast but not 55 feet. At Hopewell Cape Rocks you can watch the tide rise at a rate of 4 - 6 feet per hour. The tides happen because of the sun and the moon's gravitational force. There is a great explanation of all this on the Rocks website. Check it out. There is lots of wildlife in and around Hopewell Cape Rocks, we were fortunate enough to see a nesting Peregrine Falcon. This is one of the fastest animals in the world and can dive at speeds reaching up to 300 km per hour. Between high tide and low tide at Hopewell Cape Rocks we took a quick trip to Cape Enrage. On the way we stopped at a quaint little town called Riverside-Albert and had a lobster lunch, The Red Roof Restaurant is an awesome place to eat, it is nothing fancy, just good food. Cape Enrage, a National Historic Site, offers one of the most spectacular views of the natural phenomenon "The Bay of Fundy" from its towering cliffs and has been a light station and fog alarm since 1838. The current light house tower is over 150 years old. The beach at Cape Enrage is rich in fossils and is one of the best places in the world to beach comb for fossils. At Cape Enrage you can get a real adrenaline rush, you can be rappelling down the cliffs in no time (it was not open when we were there), and they are in the process of installing a zip line. 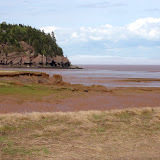 For more pictures of the Bay of Fundy, click image below. They've got my vote for The Bay of Fundy as a Wonder of the Natural World! Now I will have to go there too and see the tides, the rocks and the whole nine yards!!! Your photos and videos are terrific and are whetting my appetite for a taste of that part of Canada. The east coast is a close second to our west coast in "the best and most beautiful part of our country" contest!